Begin your day browsing the abundant stalls of the Mercato Centrale, or central market, a two-tiered, late nineteenth-century structure near the church of San Lorenzo. On the ground floor you'll find delicious prepared food, savory meats and cheeses, while brilliant produce is sold upstairs. Brave the "bollito" for breakfast and enjoy a small glass of wine at Nerbone's food stand, where in addition to the popular boiled beef sandwich you can experience the local tripe sandwich or "trippaio." If you prefer to save the inexpensive Nerbone for lunch, grab a specialty pastry at Sieni — try the "schiacciate con l'uva," an Etruscan grape-filled bread — and a coffee at one of the market's bars. Or treat yourself to an organized tour of the market along with a one-day cooking course with Judy Witts Francini, a long-time resident of Florence and owner of Divina Cucina. This popular cooking school offers one, two and three-day cooking classes that focus on Tuscan food and wine. Prices start at 290 euros for a one-day class and tasting tour of the market. Days and hours of operation are Tuesday, Wednesday and Thursday from 11:00 a.m. to 4:00 p.m.
South of the Mercato San Lorenzo towards the Arno is the picturesque straw market, Mercato Nuovo, where straw hats and bags, along with leather goods, make inexpensive gifts or souvenirs. If serious shopping is on your agenda today, then consider an excursion to The Mall. Avoid paying full price for luxurious Italian fashions in the city center when just a mere 30 minutes outside Florence you can shop in a dreamlike outlet center. Top designers include Bottega Veneta, Ungaro, Zegna, Gucci, Hogan, La Perla, Loro Piana, Ferragamo, Rossi, Tod's and Valentino. Open Monday through Saturday from 10:00 a.m. to 7:00 p.m., and on Sunday from 3:00 p.m. to 7:00 p.m., The Mall is most easily accessible by car but can also be reached via train from Florence's Santa Maria Novella station. Once you arrive at the Rignano sull'Arno station, The Mall is a five-minute taxi ride away. If you've managed to visit every museum and monument on this side of town, now might be the time to cross the time-honored Arno and venture into Florence's "rive gauche." From the Piazza del Duomo, take the Via Roma, which turns into the Via Calimala. 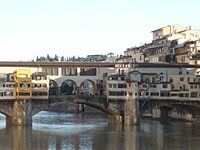 Then take the Via Por Santa Maria, which will allow you to traverse the Ponte Vecchio, or "Old Bridge." Amazingly, the bridge that spans the widest part of the Arno can trace its origins back to the Etruscans. This solid structure survived the centuries despite wars, plague and a massive flood in 1966. The current cluster of sparkling jewelry shops piled on the Ponte Vecchio was installed by the Medici family, who replaced the original Medieval merchants in an effort to embellish the city in 1593. The left bank of the Arno is home to the city's antiquarian neighborhood, soulful trattorias, friendly wine bars, cozy cafés and intriguing monuments such as the Pitti Palace, the Boboli Gardens and the Church of Santo Spirito. Time should be allotted for a visit to this village-like side of town, where your first stop may be the inviting wine bar Le Volpi e L'Uva. Its tempting appetizers, plates of cheese and thinly sliced meats are perfect for a light lunch before proceeding onto the Pitti Palace. In 1550 the palace was the residence of the Medici family, but today it's a fascinating amalgam of museums containing eclectic collections belonging to members of the Medici family throughout the ages. The Galleria Palatina showcases not only Italian masters, such as Raphael and Titian, but also Flemish and Spanish painting. A testament to the family whose patronage of the arts is largely responsible for the beauty of Florence, the Pitti apartments are filled with tapestries, furniture, porcelain and other fine works of art. On the other end of the spectrum is the Galleria d'Arte Moderna, located on the second floor of the palace and celebrating 150 years of Italian painting. The Museo degli Argenti displays silver but also jewels that belonged to the Medicis. Also in the Pitti Palace is a small museum of horse-drawn carriages and other period vehicles, which, together with the rest of the palace's galleries, should give visitors a general idea of the luxury that characterized the daily life of a Medici in Renaissance Florence. Don't even think of leaving the confines of the palace without a stroll through the lush, hauntingly romantic Boboli Gardens. 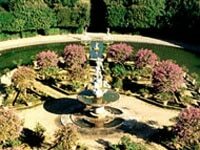 The gardens were purchased by the Medici in 1550 and slowly transformed over the years with the addition of architectural landscaping, statuary, ponds and, most notably, a large grotto designed by Bernardo Buontalenti in 1574. Long lanes of cypress trees and large, limpid basins add to the tranquil magic of this privileged park. If you can tear yourself away from the breathtaking gardens, head to the nearby Piazza di Santo Spirito. Take time to appreciate the outside of the church of Santo Spirito, a welcome respite from the heavy, ornate façades of the typical Florentine church. The stark exterior gives way to a refined interior with long aisles delineated by a succession of stately Corinthian columns. Look for the famous painting by Filippo Lippi of the Madonna and Child with the Saints. The nearby refectory boasts an impressive Last Supper fresco. With dinner on your mind, you may choose simply to stay in the area. On Via Santo Spirito, Olio & Convivium is both an ultra-fine food shop specializing in olive oil and an upscale restaurant favored by high Florentine society. In the Piazza Santo Spirito, Borgo Antico is a moderately priced pizzeria and restaurant serving up authentic ambience on the generous outdoor terrace. Take a taxi east of the Boboli Gardens and dine off the beaten path with savvy locals at Enoteca Fuori Porta, offering excellent wines, appetizers and simple, quality pastas. 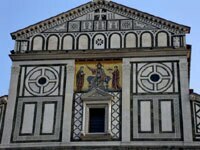 For a more formal farewell to Florence, ask your taxi driver to climb the hill to Fiesole. Here, at the restaurant of the luxurious Belmond Villa San Michele, you can enjoy drinks, dinner and celestial views of the Arno Valley on the romantic loggia. And although the epicurean experience may be ephemeral, the enchantment, like Florence itself, is eternal. 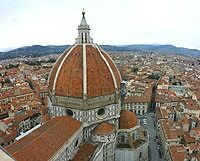 For more information, visit the Florence Tourism Office, www.firenzeturismo.it.